A view of the Annual Diabetes Walkathon taken out Friday at the Oxygen Park in Education City by Qatar Diabetes Association. PICTURE: Jayaram. Over 7,000 people joined the Annual Diabetes Walkathon taken out Friday at the Oxygen Park in Education City by Qatar Diabetes Association (QDA), a member of Qatar Foundation for Education, Science and Community Development (QF). 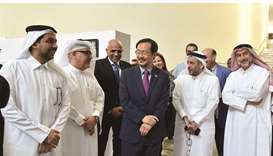 The event was held in conjunction with the International Diabetes Federation (IDF)'s campaign to raise awareness about the risks of type 2 diabetes and its increasing prevalence in the world among all age groups, especially among the youth. 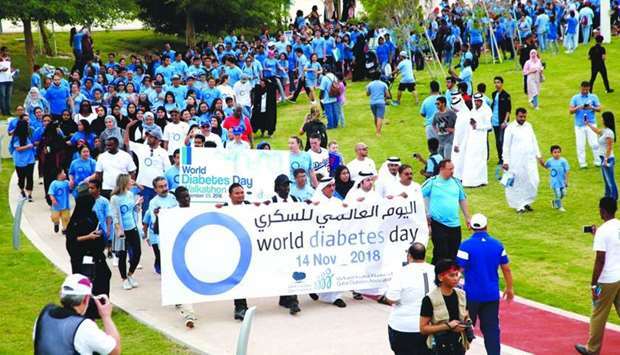 The activities began at 2pm and culminated in the walkathon that started at 4pm with the thousands of participants wearing blue T-shirts, the colour of the World Diabetes Day. 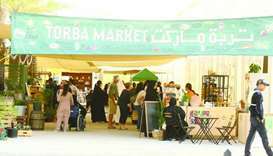 Families and large groups representing schools and organisations came together to support and take advantage of events offered through health education booths on diabetes prevention with free tests for blood glucose level for the participants. QDA executive director Dr Abdulla al-Hamaq said: "During November, people from all over the world are taking part in Diabetes Walks to mark the World Diabetes Day. We organise our walkathon annually to raise diabetes awareness and to recognize the people live with diabetes in Qatar and worldwide. We also want to focus and promote the role of the family in diabetes management and care of their children living with type 1 diabetes and their role in preventing type 2 diabetes, as diabetes concerns every family. As you may be aware, the theme of this year is Family and Diabetes. 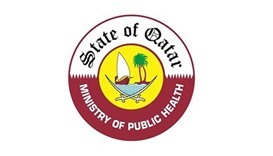 Many health institutions participated with QDA, increasing awareness and offering care and support to all families. Members of QF, including Sidra Medicine WISH, National diabetes Strategy, Qatar Biomedical Research Institute and Qatar Biobank, participated in the event in addition to the Qatar Red Crescent Society and Tobacco Control Center. 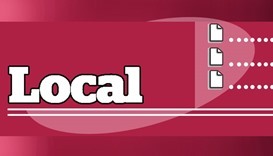 The sport organisations had an active part in the event presented by Qatar Football Association and the Committee for Women's Sports. Dr al-Hamaq added: "We are indeed thankful and pleased with the participation of the prestigious health institutes and sport sector who have a shared responsibility in highlighting the importance of making healthy lifestyle choices creating a culture of wellness among our society. And I also would like to thank Qatar Foundation for their valuable support and efforts to make this walkathon a real success"
Recent figures from the seventh edition of the IDF’s Diabetes Atlas indicate that the number of people living with diabetes around the world is expected to rise from 415mn to 642mn by 2040. A sedentary lifestyle, unhealthy eating habits and low levels of awareness are noted as key contributors to the rapid incidence of type 2 diabetes in Middle East and North Africa.